Mark Ogden, Director of Strategic Partnerships with newly appointed Chief Executive Officer, Michelle Beech. While leading the way with the roll out of a number of significant initiatives to improve transparency and trust in the aged care sector, today DPS Publishing announced a change in leadership, appointing its first female Chief Executive Officer (CEO) in the organisation’s history. The multi-platform media company will see Mark Ogden, who has been leading the organisation since July 2017, pass on the torch and day to day running of DPS to the company’s General Manager Michelle Beech. This leadership change will pave the way for the future for DPS, the company behind Aged Care Guide and Disability Support Guide, supporting the vision of the 21 year old organisation to help consumers make informed aged care and disability support decisions and connect them with providers. Ms Beech has been with the company since 2017, most recently in the role of General Manager. With a financial background she previously worked in a number of roles including Chief Financial Officer and General Manager in many different industries ranging from packaging, solar and IT to aged care and disability. She says she’s incredibly excited about what the future holds for DPS and thanks Mr Ogden for his leadership and support over the past 18 months. “Having previously worked in the aged and disability sectors I saw firsthand how hard it is for both consumers navigating the system, trying to find information and providers of services, and the challenges for providers trying to let consumers know that they exist and what services they can provide to help. DPS provides that platform in both print and digital. "Whilst I am no longer involved in providing rewarding care services directly to the consumer, seeing the difference you make in someone’s life by just caring, I know what DPS does is just as important and will help people at a time when they need it the most on their journey. “Mark has taken DPS to a new level, through developing new initiatives such as the amazing work he has done with Care Opinion on Aged Care Guide and Connect & Compare, as well as developing key relationships in the aged and disability sectors, and I’m glad he is continuing his involvement with DPS,” Ms Beech adds. Moving from his role as CEO, Mr Ogden will continue working with the business as Director of Strategic Partnerships. His focus will be on developing the reach of the DPS network by building and maintaining its alignment and key partnerships with stakeholders in the sector, an integral part of the long term success plan for DPS. “I’m looking forward to continuing to represent DPS and further developing the important partnerships with Government, industry and consumer peak bodies, providers and commercial partners,” Mr Ogden says. “DPS plays a very important role in the sector as the largest gateway connecting consumers with providers. By working collaboratively with the key stakeholders in the sector we can not only continue to grow the value we generate, but assist in the transition to a consumer-centric model that meets the changing needs of senior Australians. Among the announcements, DPS Founder and Chairman of the Board, David Baker spoke out about the leadership change and announced he is resigning from his Board position. 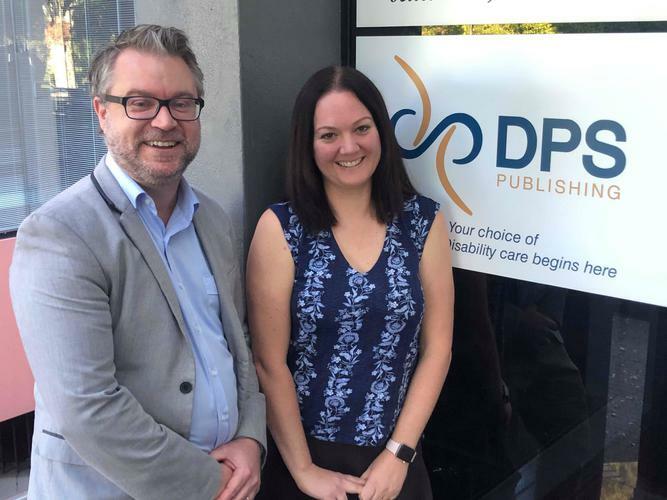 "The transition to Michelle Beech as the new Chief Executive Officer of DPS Publishing will bring a new style of leadership that is growing in effectiveness across the corporate world. This is a perfect combination of exceptional corporate and executive talent to develop and execute the best strategic plan coupled with an uncanny ability to deeply connect with people which ensures the team are absolutely committed and trust her leadership,” Mr Baker says. “Michelle is driven by an insatiable motivation to care and empower people which marries perfectly with DPS’ mission to help and guide people through a crisis and to provide tools, products and services to enable care providers to reach out to these same people." Founding the company over 20 years ago, Mr Baker has been integral in the development of DPS and its publications valued by the Australian ageing and disability community. Stepping down from the DPS Board enables Mr Baker to focus on his new business venture, 5friends, aimed at curing the next big epidemic, loneliness. His wife Dr Jennifer Biggins will be taking on the Director role going forward. "I am absolutely confident that Michelle Beech will be a strong leader as DPS Publishing bridges the traditional publishing media business with cutting edge digital products that will deliver to consumers the needed information and guidance to better navigate aged, community and disability care,” Mr Baker adds. With the changes in leadership DPS has also overcome the gender divide in the company by going from an all male Board and CEO to form an organisation with real gender diversity. “As a woman, in a world where women don’t hold many high-level positions, with current stats showing only 17.1 percent of women hold the position of CEO in Australia, it is great to see DPS embrace the gender diversity of its new leadership and board,” Ms Beech says.